Growtopia is a 2D creative sandbox experience designed for multiplayer that is perfect for your mobile devices (both iOS and Android). The game is also available on Windows and Mac. Growtopia is a universe of endless worlds that players can populate with their own creations. Every place in the game world runs in a persistent manner with connections to other worlds everywhere. In Growtopia you can do anything that you can imagine with your friends (or by yourself if you are just looking to create quietly). 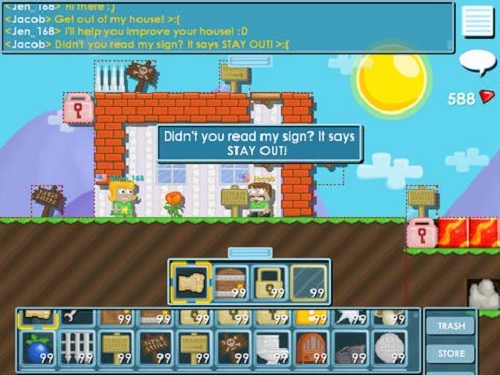 The way you create in Growtopia is very unique and uses a method referred to as ‘splicing’ which involves planting seeds in particular combinations to make things. This growing mechanic is then combined with digging to round out your available tools. It’s easier than it might sound and you can quickly build your own houses, dungeons or thriving cities. The feature list for Growtopia doesn’t stop there though with all the chat options you’ll need to make new friends or stay in touch with your current ones. The game also features an intuitive locking feature that lets you lock down your creations to keep them safe. 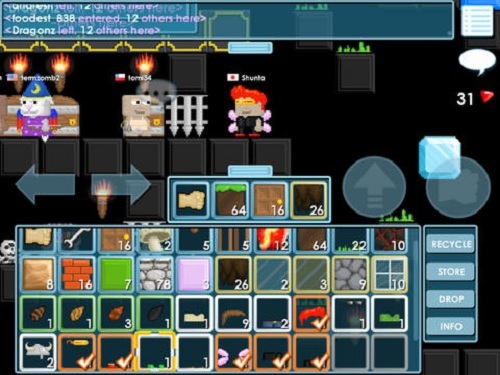 With so much to do in the game world you’ll find that Growtopia’s newbie guide is an invaluable resource and worth taking the time to read carefully when you first open up the game (it will save you a lot of time in the long run). Growtopia is a nice change from other sandbox building games that have come around and it’s quickly grown a community to support its MMO side of gameplay. If you aren’t one for socialising with others or interested in learning a new game mechanic that takes some getting used to though. you might want to give it a miss. A persistent and connected game world. Chat with your friends or make new ones. Lock down your creations to stop editing from others. I hope that is helpful enough for you but over and out! Agreed… Those old trailers just outdate the game….. Now though its awesome im like addicted ina good way xD. whenever i get on now there are atleast 30 k peple online too, and it can go to 50k.